Following previous work (Barnes et al. 2007, Lorenz et al. 2008, Burr et al. 2009), three criteria were used in the delineations: (a) distinguishability in tone (bright or dark) from the surrounding terrain, (b) a bright/dark pairing consistent with illumination direction that is indicative of a trough, and (c) fluviatile morphology, i.e., having sinuous links and/or a branching pattern. Features of all levels of certainty (Burr et al., 2013, Figure 1, top) were included in the subsequent drainage pattern analysis (Burr et al., 2013, Figure 1, bottom). During this analysis, those features (reaches) of different certainty levels that formed individual links were aggregated into links in our ArcGIS files. For networks having fewer than 10 links, which were not analyzed, the features (reaches) were not aggregated. http://authors.elsevier.com/sd/article/S0019103513002728, Barnes, J. W., et al., 2007. Near-infrared spectral mapping of Titan’s mountains and channels, J. Geophys. Res., 112, E11006, doi:10.1029/2007JE002932., Burr, D.M., et al., 2009. Fluvial network analysis on Titan: Evidence for subsurface structure and west-to-east wind flow, southwestern Xanadu. Geophys. Res. Lett. 36, L22203, doi:10.1029/2009GL040909., Elachi, C., et al., 2005. Cassini Radar views the surface of Titan. Science 308, 970-974, doi: 10.1126/science.1109919., Lorenz, R. D., et al., 2008. Fluvial channels on Titan: Initial Cassini RADAR observations. Planet. Space Sci. 56, 1132-1144. Please cite authors: Burr, D.M., S.A. Drummond, R. Cartwright, B.A. Black, and J.T. Perron, 2013, Morphology of fluvial networks on Titan, Icarus, doi. 10.1016/j.icarus.2013.06.016. Fluvial features were tagged on a best effort basis. Mapping was limited to image coverage. See included Cassini SAR mosaic for coverage. 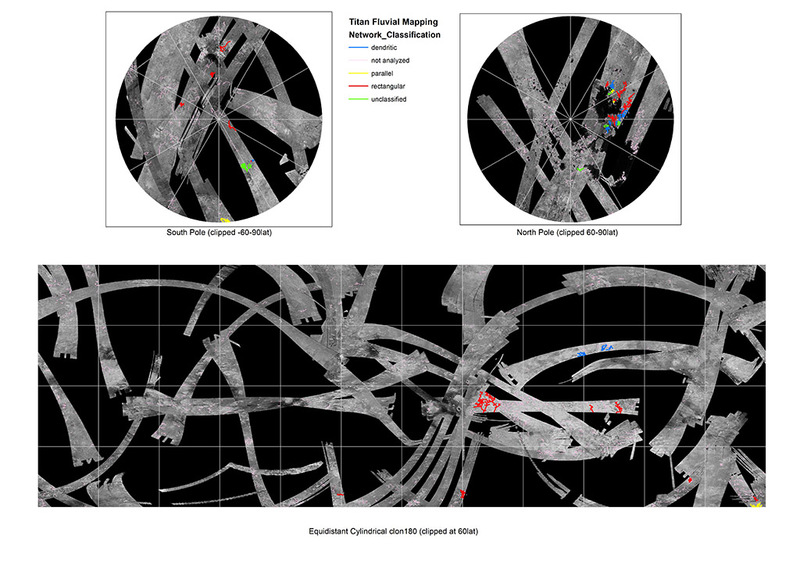 The fluvial features were delineated as vector-based polylines within ArcGIS 10.1 software using Cassini Titan Radar Mapper synthetic aperture radar (SAR) swaths (Elachi et al., 2005) from T0 through T71. Following previous work (Barnes et al. 2007, Lorenz et al. 2008, Burr et al. 2009), three criteria were used in the delineations: (a) distinguishability in tone (bright or dark) from the surrounding terrain, (b) a bright/dark pairing consistent with illumination direction that is indicative of a trough, and (c) fluviatile morphology, i.e., having sinuous links and/or a branching pattern. The polyline layer, named Titan_fluvial_mapping_V2, is released in the Esri 10.x geodatabase and and Esri Shapefile formats. Within this polyline file there exists several feature attributes including: (1) Sph_Len - Accurate geodesic length in meters, (2) Start_Az - Angle of the feature at the start of the line, (3) End_Az - Angle of the feature at the end of the line, (4) Network_Classification - can be defined as Rectangular, Dendritic, Parallel, Unclassified, Not Analyzed (5) Titan_Flyby - Titan track or orbit pass which represents the image used for classification.